Bathtub Reglazing Discounts at Dr. Tubs Reglazing & Liners are here! Just give us a call or fill out our contact form and use the promo code: WReglaze499 to qualify for this offer! 2019 Sales at Dr. Tubs Reglazing & Liners are here! 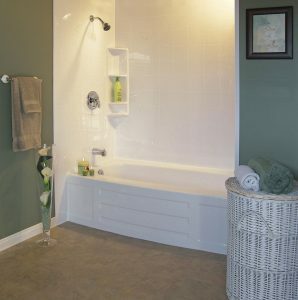 Get your impact resistant acrylic tub & wall liner for only $3,492.00! Just give us a call or fill out our contact form and use the promo code: WLiners19 to qualify for this offer! 1x built-in 4-shelf deluxe corner unit. Our liners are custom-made and manufactured in Canada from the strongest acrylic around. They are high impact, high resistant and are made to fit right over the existing tub and tile. They come in white and the wall-surround can come in a mock-ceramic tile. We only use high quality non-porous acrylic that won’t chip, dent, stain or fade and best of all, it’s easy to clean with any non-abrasive liquid soap and a soft cotton cloth. There is no need to rip out your existing tub when you can save money and have your bathroom looking brand new. Call 416-630-9143 and ask about having your bathtub and wall-surround custom lined with the strongest, Canadian-made, high-impact high resistant acrylic liners on the market. Trust the Doctor, that’s the bottom Line-r.
Bathroom Renovation deals and promotions. 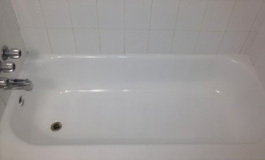 Bathtub reglazing, refinishing, bathroom, tiles, sink resurfacing and renovations.